Glitch Games, the makers of the “Forever Lost” series (episode 3 is in the works! ), just came out with another adventure game. This one is noticeably different from the dark-toned Forever Lost games. 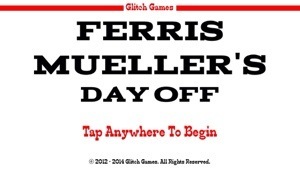 “Ferris Mueller’s Day Off” is a spoof of the wildly popular 80’s movie, “Ferris Bueller’s Day Off.” Unlike the darker games we’re used to seeing from the developers, this new one utilizes very bright, rough animations. There’s much more dialogue, and it’s very tongue-in-cheek, often making fun of itself. And it’s filled with puns. Seriously. There are puns everywhere. 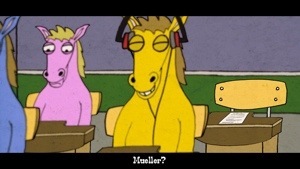 Mueller, in case you haven’t figured it out yet (I didn’t realize until I started playing), is a mule who’s gone missing. He left you a sort of ransom note, reminding you that he’s your mule, not your slave. 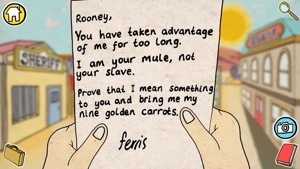 If you want to see him, you’ll have to bring him nine golden carrots to prove how much he means to you. Honestly, when I saw the previews of the game, I wasn’t too excited about the graphics. But once I started playing, I realized the rough cartoony drawings work really well with the humorous tone of the game. You know right away not to take the game too seriously. The characters are sometimes aware they’re in a video game. There are plenty of references to the developers within the game. 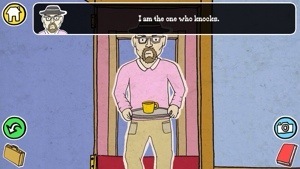 The humor reminds me of Telltale Games’ Hector series, but even more tongue-in-cheek. It’s also a lot like the Broken Sword games by Revolution. There are tons of Easter eggs for players to find. You can tell the developers had loads of fun making this game. They reeeeeeally like their puns and play-on words, which will probably make you want to slap them and kiss them at the same time. Back to the Easter eggs. For those unfamiliar with 80’s pop culture, don’t worry — current shows like “Breaking Bad,” “The Big Bang Theory” and “It’s Always Sunny in Philadelphia” get big nods as well. And the game is completely playable without having watched any of these shows or movies. It’s just a fun bonus to see how many of these you can catch (feel free to share what you find in the comments section below). While the humor and inside jokes certainly steal some of the spotlight in “Ferris Mueller,” this is still an adventure game, and there are tons of unique puzzles to solve. Some can be challenging, but they’re all logical and can be figured out with the clues scattered throughout the place. There was only one clue that I feel doesn’t work quite right, but they may fix it in an update. Even if you don’t figure it out on your own, the in-game hints system can save you (or see our step-by-step walkthrough here). Because of the play-on words, some clues may not seem so obvious at first, but once you know to look out for them, they’re easier to catch. 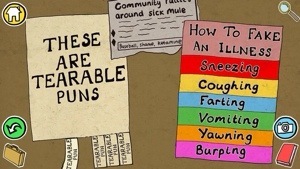 And much more amusing. 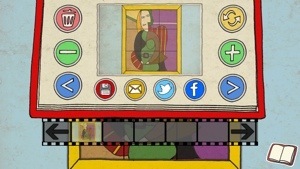 “Ferris Mueller” also includes the familiar handy in-game Glitch camera that allows players to snap photos of clues throughout the game, then view a smaller version of that photo (and even multiple photos at once) on the same screen while solving a puzzle. There’s even a drawing tool that came in handy for a particularly tricky puzzle that would have required pen and paper to solve otherwise. It is an indispensable tool that you’ll want to make good use of as you explore. It’s something I wish every mobile adventure game would have. One thing I’ve come to expect from Glitch Games is seamless gameplay, and once again they delivered. As someone who gets easily frustrated by long loading screens or any sort of silliness that inhibits the exploration aspect of an adventure game, I sincerely appreciate Glitch Games’ ability to eliminate all loading times (except for one instance, used to express the passage of time). On my iPhone 5, there’s almost no time wasted between launching the app and starting/continuing the game. The game is lightning fast. Jumping back and forth through screens is quick and painless, so you don’t need to worry about missing a clue. It’s easy enough to go back and look for what you might have missed. This is something that many developers overlook, so I can’t stress enough how much I appreciate it when a game works so seamlessly. I find it crucial in order to keep players playing to the end. All in all, if you’re a fan of point-and-click adventure games, you do not want to miss this one. You’ll solve tons of puzzles, get a few chuckles, and maybe even get inspired to watch (or re-watch) “Ferris Bueller’s Day Off” when you finish. Download it here. And if you need help with the game, you can find our walkthrough here.